Fast and thermal neutron fluence rates from a 15 MV X-ray beams of a Siemens Primus Linac were measured using bare and moderated BF 3 proportional counter inside the treatment room at different locations. Fluence rate values were converted to dose equivalent rate (DER) utilizing conversion factors of American Association of Physicist in Medicine's (AAPM) report number 19. For thermal neutrons, maximum and minimum DERs were 3.46 × 10 -6 (3 m from isocenter in +Y direction, 0 × 0 field size) and 8.36 × 10 -8 Sv/min (in maze, 40 × 40 field size), respectively. For fast neutrons, maximum DERs using 9" and 3" moderators were 1.6 × 10 -5 and 1.74 × 10 -5 Sv/min (2 m from isocenter in +Y direction, 0 × 0 field size), respectively. By changing the field size, the variation in thermal neutron DER was more than the fast neutron DER and the changes in fast neutron DER were not significant in the bunker except inside the radiation field. This study showed that at all points and distances, by decreasing field size of the beam, thermal and fast neutron DER increases and the number of thermal neutrons is more than fast neutrons. One of the modalities in RT is the use of a medical linear accelerator (LINAC) generating bremsstrahlung photon beams. Photon beams with energies higher than 10MV are preferred if doses should be delivered to larger depths and to enhance the skin sparing. The importance of neutron contamination at medical LINACs has been recognized in NCRP reports 79 and 102. , Neutrons have a substantially higher biological effectiveness than photons; therefore, even a small number of neutrons can lead to a nonnegligible dose component. Therefore, precise knowledge of these small dose components is necessary. In this case, special radiation protection methods have to be implemented in order to prevent the exposure of patient and medical staff. In conventional RT, unwanted neutrons are usually considered negligible; however, accounted for when designing radiation protection for treatment rooms. Chibani and Ma found that for the 18MV photon beam of a Siemens Primus Linac, the dose value of neutrons at a given depth in the field increased with increasing field size. Al-Ghamdi et al.,  showed that for fast neutrons the intensity does not vary significantly with field size for the measurements outside the primary beam and it decreases linearly with field size in the field. The thermal neutron intensity at any location in the treatment room (i. e., in and out of the field) was found to be almost independent of field size. In another study by Hashemi et al., it was shown that neutron dose equivalent (NDE) increases with field size for both open and wedged beams. Reft et al., reported that both the in vivo and Bonner sphere results show different secondary fast neutron dose among the three different therapy machines. However, it is difficult to form conclusions based on these studies considering the effect of field size on the photoneutron contamination. Due to the variation reported in the literature, the differences in the geometry of various treatment rooms and LINACs (even with the same type), further measurements of neutron contaminations are needed. Therefore, for each LINAC and treatment room, it is better to investigate neutron contaminations separately. It seems in addition to machine's components, other parameter such as bunker design and its materials' composition are also responsible factors for the production of photoneutrons. In this study, by using a BF 3 proportional counter, fast and thermal neutron fluence rate from an 15 MV X-ray beam of a Siemens Primus LINAC was measured inside the treatment room (i. e., at different distances from isocenter and special points) in various radiation field sizes. In order to convert the fluence rate values to dose equivalent rate (DER), conversion factors of American Association of Physicist in Medicine's (AAPM) report number 19 and Cossairt and Vaziri  applied formula were utilized. The effect of variation of the distance from isocenter and radiation field size in thermal and fast neutrons DER was investigated in this research. In this study the external therapy machine was a Siemens Primus LINAC with two photon modes (6 and 15 MV). Since the threshold of photoneutron reaction is approximately more than 7 MeV, neutron contamination for 15 MV photon beam with dose rate of 1.8 Gy/min was measured using a BF 3 proportional counter (BDPN-07, ECOTEST, Ukraine). It has cylindrical shape with two spherical moderators (9" and 3" diameter) for measuring fast neutron fluence rate and bare BF 3 counter for measuring the thermal neutrons (in terms of n/cm 2 min). In this study, fast and thermal neutrons fluence rate at 0, 1, 2, and 3 m from isocenter in two direction (−X and +Y) and in points A, B, C, D, and E inside the treatment room and maze [Figure 1] were measured at three different field sizes. [Figure 2] shows experimental set-up at isocenter. BF 3 counter was calibrated at Secondary Standard Dosimetry Laboratory (SSDL) of the Iranian Atomic Energy Organization (IAEO) and all data about thermal and fast neutrons are available for different neutron energies. Main relative permissible error limit of thermal and fast neutron flux density measurement of this device when calibrated for PuBe with 0.95 confidence probability was 20 + 200/N, where N is a numeric value of measured neutron fluence density. In all measurements, the maximum standard variation in fluence rate values was less than 2%. In this study, for calculating thermal neutrons' DER (~ Ē < 1eV), Cossairt and Vaziri  applied formula was used (i. e., for ~ Ē < 1eV dose equivalence is 10.2 pSv/n/cm 2 ). [Table 1] shows thermal neutron DER (Sv/min) at various locations and different field sizes inside the treatment room of LINAC. For thermal neutrons, maximum and minimum DERs were 3.46 × 10 -6 ( 3 m from isocenter in +Y direction, 0 × 0 field size) and 8.36 × 10 -8 Sv/min (in maze, 40 × 40 field size), respectively. According to the results; by increasing the distance from the center of the radiation field in the +Y direction, thermal neutron DER per dose rate of X-ray at isocenter increases at different field sizes (e. g., from 3.31E-06 to 3.46E-06 Sv/min, 0 × 0 field size). This increase was observed until 1 m in X direction (e. g., from 3.31E-06 to 3.35E-06 Sv/min, 0 × 0 field size). It seems that in opposite to +Y direction in which the bunker wall is closer to isocenter, in −X direction, the large distance of bunker wall is the main reason for reduction of thermal neutron fluence from 1 to 3 m. For points A to E inside the treatment room and maze, thermal neutron DER had the largest value in A (3.05E-06 Sv/min, 0 × 0 field size) and the least value in E (8.36E-08 Sv/min, 40 × 40 field size). In all locations, by decreasing field size of the beam, thermal neutron DER increases. This is because of increasing the (γ, n) interaction probability (due to hitting to the heavy metals in the beam path) by decreasing the field size. 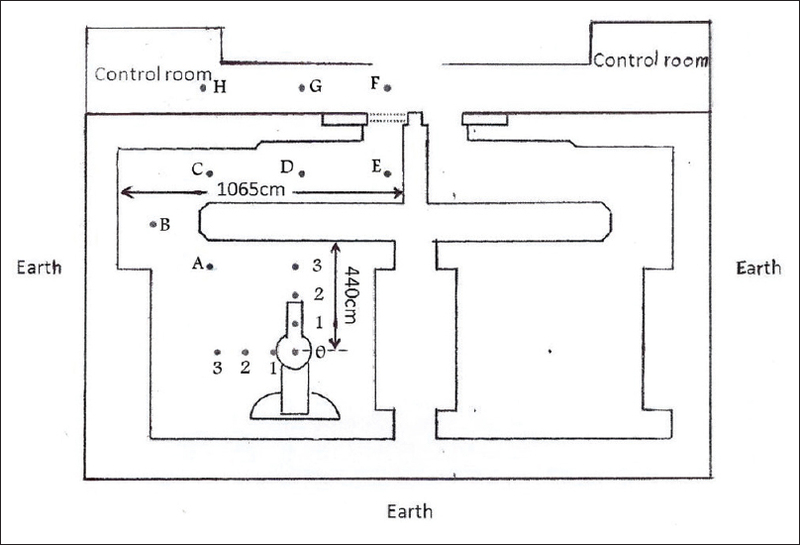 Measurement of fast neutron fluence rate in this study was performed by means of two moderators (3" and 9" diameter, spherical shape) specific for BF 3 proportional counter. These moderators thermalize the fast neutron and help to count them by BF 3 counter. Using available moderators (i. e., 3" and 9") just the mean energy of fast neutrons could be estimated. For deriving conversion factors for fast neutrons, the AAPM 19  report was used. 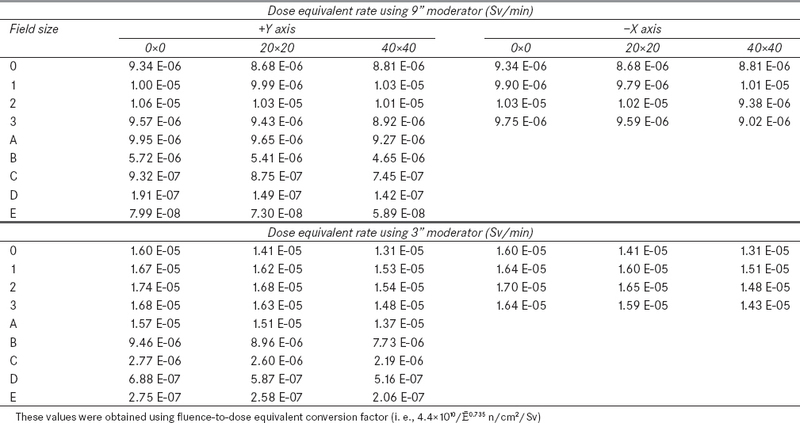 According to this report fluence-to-dose equivalent and fluence-to-absorbed dose conversion factors as a function of neutron average energy are 4.4 × 10 10 /Ē0.735 n / cm 2 /Sv and 4.5 × 10 10 /Ē0.5 n / cm 2 /Gy, respectively. [Table 3] shows fast neutron DER in various locations and different field sizes inside the treatment room for two moderators. These values obtained using mentioned fluence-to-dose equivalent conversion factor (i. e., 4.4 × 10 10 /Ē0.735 n / cm 2 /Sv). For fast neutrons, maximum DERs using 9" and 3" moderators were 1.6 × 10 -5 and 1.74 × 10 -5 Sv/min (2 m from isocenter in +Y direction, 0 × 0 field size), respectively. At the farthest point in the maze, where the neutron has its lowest energy, the neutron fluence values for 3" moderator (e. g., 2.75E-07 Sv/min, 0 × 0 field size) are somewhat larger than 9" moderator (e. g., 7.99E-08 Sv/min, 0 × 0 field size) [Table 3]. For both moderators, fast neutron DER increases by increasing the distance from the radiation field center until 2 m in both +Y and −X directions at different field sizes [Table 3]. Moreover, in all points and distances, by increasing field size of the beam, fast neutron DER decreases. This is because of decreasing the (γ, n) interaction probability in the beam path. However, this decrease is not significant in comparison with the variation in thermal neutron DER. Moreover, for both moderators, in all studied field sizes, fast neutron DER had the largest value in point A and the least value in point E.
It is clear, because of large size of dosimeter; angular resolution for dose distribution has not been considered in this study and seems it is not isotropic. From the obtained results, it could be generally noted that, by changing the field size of the 15 MV X-ray beam, the percentage of variation in thermal neutron DER is more than fast ones. In all distances and points in all studied field sizes, the number of thermal neutrons is more than fast ones. For points A-E inside the treatment room and maze, thermal and fast neutron DER had the largest value in A and the least value in E. In all points and distances, by decreasing field size of the beam, thermal and fast neutron DER increases. However for fast neutrons, this increase is not significant in comparison with the variation in thermal neutron DER. In the studied field sizes, by increasing the distance from isocenter to 2 m, thermal and fast neutron DERs increase. It seems that scattering component of neutron fluence from bunker's walls is the main reason. It is worth to mention that in this study, room scattering component have not been measured. Maximum fluence rate values obtained in this study are less than ones reported by Fox and McAllister, McGinley et al., and Axton and Bardell ,, for 18, 25, and 16 MV X-ray beams of LINACs, respectively. This study showed that in all distances and points in all studied field sizes, the number of thermal neutrons is more than fast ones; and in all points and distances, by decreasing field size of the beam, thermal and fast neutron DER increases. This research also showed larger variation of thermal neutron DER than fast neutron DER with field size and also depicted that component of wall scattering is an important part of the total neutron fluence inside the bunker. Since the obtained maximum fluence rate values in this study differs from the others, it could be concluded that because of the differences in the structure of the various treatment rooms, the concrete materials of the walls, and the type of machines; the mechanism of neutron collisions differ from one RT center to another (even with the same machine). This study was performed in the Dr. Esmayeel Shafie Radiotherapy center, Sari, Iran. The authors would like to greatly thank Dr. Shafie for his valuable role in foundation of this radiotherapy center. Xu XG, Bednarz B, Paganetti H. A review of dosimetry studies on external-eam radiation treatment with respect to second cancer induction. Phys Med Biol 2008;53:R193-241. Wilenzick RM, Almond PR, Oliver GD Jr, De Almeida CE. Measurement of fast neutrons produced by high-energy X-ray beams of medical electron accelerators. Phys Med Biol 1973;18:396-408. (NCRP) NCoRP. Medical X-ray, Electron and Gamma-Ray Protection for Energies up to 50 MeV. NCRP Report 102, 1989. (NCRP) NCoRP. Neutron Contamination from Medical Linear Accelerators. NCRP Report 79, 1984. Waller EJ, Jamieson TJ, Cole D, Cousins T, Jammal RB. Experimental and computational determination of neutron dose equivalent around radiotherapy accelerators. Radiat Prot Dosimetry 2003;107:225-32. Lee JH, Hwang WS, Chiu CH, Chen WL. Dose equivalent measurement in the vicinity of a medical linear accelerator. Nucl Sci J 1998;35:182-7. McGinley PH, Ghavidel S, Landry JC. A study of photoneutron dose levels produced by the Phillips SL medical accelerator. Radiat Prot Manage 1993;10:45-50. McGinley PH, Landry JC. Neutron contamination of x-ray beams produced by the Varian Clinac 1800. Phys Med Biol 1989;34:777-83. Fenn JO, McGinley PH. Stray photoneutron fields produced by the GE Saturne accelerator. Radiat Prot Manage 1995;12:39-45. Lin JP, Chu TC, Lin SY, Liu MT. The measurement of photoneutrons in the vicinity of a Siemens Primus linear accelerator. Appl Radiat Isot 2001;55:315-21. Fox JG, McAllister JD. Fast neutrons from a 25-MeV betatron. Med Phys 1977;4:387-96. Axton EJ, Bardell AG. Neutron production from electron accelerators used for medical purposes Proceedings of a Conference on Neutrons from Electron Medical Accelerators 1979; NBS Special Publication 554 (National Bureau of Standards, Gaithersburg, MD); 109. Al-Ghamdi H, Al-Jarallah MI, Maalej N. Photoneutron intensity variation with field size around radiotherapy linear accelerator 18-MeV X-ray beam. Radiat Meas 2008;43:495-9. Hashemi SM, Hashemi-Malayeri B, Raisali G, Shokrani P, Sharafi AA. A study of the photoneutron dose equivalent resulting from a Saturne 20 medical linac using Monte Carlo method. Nukleonika 2007;52:39-43. Reft C, Muller-Runkel R, Myrianthopoulos L. Measurement of photon and neutron doses outside the treatment field for prostate patients undergoing 18MV IMRT. Med Phys 2005;32:2059-60. Chibani O, Ma CM. Photonuclear dose calculations for high-energy photon beams from Siemens and Varian linacs. Med Phys 2003;30:1990-2000. Cossairt JD, Vaziri K. Neutron dose per fluence and weighting factors for use at high energy accelerators. Health Phys 2009;96:617-28. AAPM. Neutron Measurements Around High Energy X-ray Radiotherapy Machines AAPM American Association of Physicists in Medicine 1986; Report No 19. Schwartz RB, Eisenhauer CM. The Design and Costruction of a D 2 O-Moderated 252 Cf Source for Calibrating Neutron Personnel Dosimeters Used at Nuclear Power Reactors. Washington, DC: National Bureau of Standards; 1980. p. 1-23.